A study of the 2010 school year by the Education Department shows that the nation’s four-year high school graduation rate is the highest it has been since 1976. The national dropout rate has also fallen to about three percent overall. Many students who don’t finish their coursework in four years instead take five or more to get their diploma, thus they graduate, but not on time (the rate mentioned in this article is for on-time high school graduations only). One believed contributor to this rise in graduation rates is the struggling economy and the increased competition for jobs, as a high school dropout has a very hard time finding a good job, let alone any job at all. 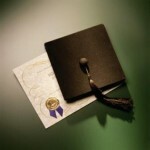 About 3.1 million students earned their high school diploma in 2010, with 78% earning it on time (in four years). This is the best rate since 1976 when the rate was 75%. While 78% is a great achievement for the United States education system, that is still more than one-fifth of students who are not graduating high school on time. This rate is not uniform across states, with large difference between the top and bottom states. Vermont and Wisconsin top the list at 91% on time graduation, while Nevada and Washington D.C. came in at the bottom, with 58% and 60% rates respectively. With our education system ranking 17th in the developed world, there is still much room for improvement. Richard is a Consultant at Fulcrum Inquiry, an accounting and economics consulting firm that performs economic damages analysis involving commercial litigation, financial investigations, business valuations, and forensic accounting.